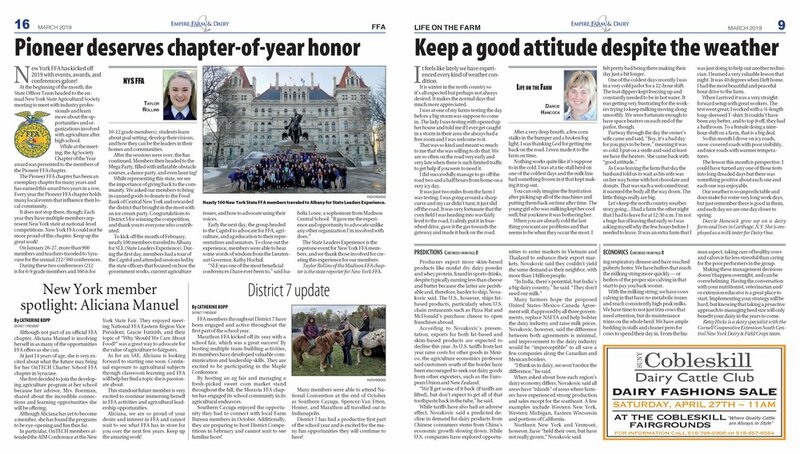 The Pioneer Central School FFA Chapter received NYS FFA Chapter of the Year honors for the second consecutive year from the NYS Agricultural Society January 9th in Syracuse, NY. The honor was one of 8 awards the Society presented at their 187th Annual Forum. The event was attended by nearly 400 producers, educators, promoters, agribusinesses, and government representatives. The theme of the 2019 event was entitled "The Shifting Winds of Trade," and provided attendees with a perspective on international trade disputes currently making national and industry headlines. See the release attached. Caption information below. For more information, please feel free to call or email using the contact information below. 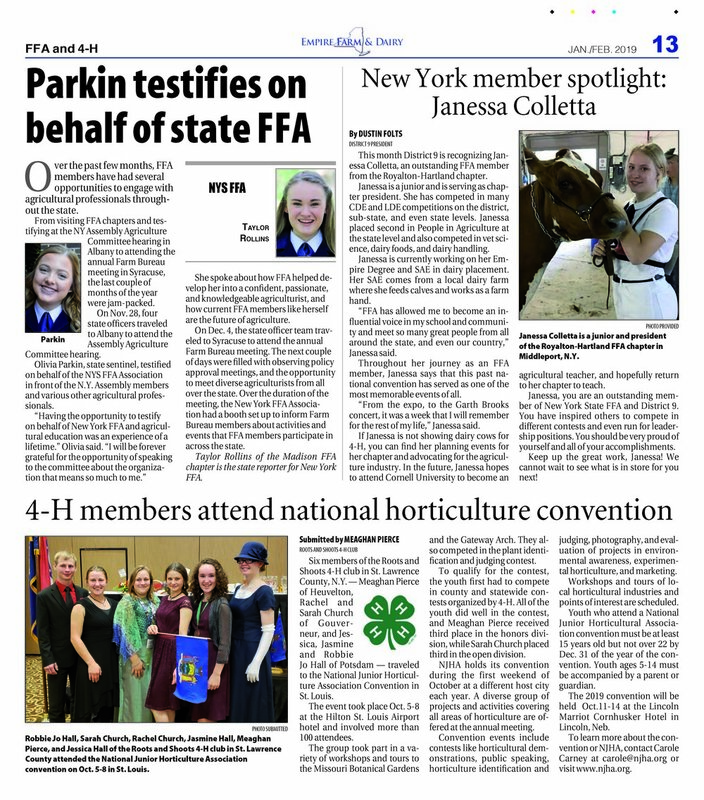 Caption: The Pioneer Central School FFA Chapter received NYS FFA Chapter of the Year honors for the second consecutive year at the 187th Annual Meeting & Forum of the NYS Agricultural Society January 9 in Syracuse, NY. The award recognizes the impact that FFA has on leadership development, personal growth and career success. Bottom row, L to R: Stephen Coye – NYS Grange (Sponsor), Commissioner Richard Ball – NYS Department of Agriculture & Markets, KristiAnn Frank, Stephanie Fyock, Danielle Herrick, Taylor Rollins, Anna Bica, Elizabeth Claypoole – NYS Ag Society President. Top row, L to R: Peyton Fontaine, Dylan Owens, Cameron Murphy, Mitchell Ling, Ethan Billman, Patrick Coombe. Click here to read the press release.